Hi, I’m Sean Robertson, Deputy Sector Marshal at Mountain Box (Sector 9) on the TT course, and an Ambassador at Liverpool Cruise Terminal. 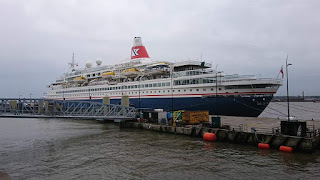 Every year we welcome thousands of bikers through Liverpool on their way to the Isle of Man and I have updated my guide to Liverpool and the embarkation process to help your journey to the Isle of Man go smoothly and safely. From M62, M57, M58 follow signs for “Waterfront” not for the commercial freight docks. As you approach the tall waterfront buildings the Royal Liver Building is recognisable by the Liver Birds on top of the towers, head for this building, the access to the ferry check in is off the half roundabout next to this building. If you’re coming in on the M62 the speed limit reduces to 50 about half a mile from the end (with a very profitable speed camera, next to the “Motorway Ends 1/3rd Mile” overhead sign). From the M53, go through the Wallasey Tunnel, when leaving at the Liverpool tunnel keep right and follow for the Waterfront – the exit road from the tunnel is a favourite place for the police to do speed checks – 30mph. Once off the tunnel approach road and onto Scotland Road you'll be turning right at the next lights. Then carry straight on until the road veers to the left after the 3rd set of lights, get into the right-hand lane and turn right at the Liver Building. From the A41 through Cheshire head for the Birkenhead tunnel. (Rock Ferry Bypass now has 50mph average speed cameras) As you approach the tunnel entrance get into the left-hand lane, the tunnel is 2 miles long, but towards the end there is a left turn, take this and when you emerge from the tunnel you’ll be directly opposite the Liver Building. Go straight ahead at the lights leaving the tunnel, then get into the right lane as you turn right at the next lights. For both tunnels, motorbikes are free, there is a dedicated motorbike lane at the toll booths, Cars are £1.80, and you pay in cash or use a contactless card at the booths (Birkenhead/Wallasey end only - both directions). From the M56 follow signs for the Mersey Gateway Bridge, this is a toll bridge, it is free for motorbikes but if you’re in a car or van you need to pay (£2 for cars), there are no toll booths you need to log onto Merseyflow and pay your toll, you have until midnight the day after you cross the bridge, but you can log on and pay in advance and the toll will be taken when you cross. As with any large city, Liverpool has its share of crime, although statistically, and despite the stereotypes, it has one of the lowest levels of vehicle crime of any large UK city. However, if yours is the bike that gets stolen statistics are meaningless. Opportunistic and organised thieves will always help themselves to easy pickings and thousands of bikers who don’t know the area are an all too easy target. There are very few incidents near the terminal itself, probably due to amount of people around, but bikes have been stolen from outside hotels, especially away from the city centre. If you are staying overnight make sure your bike is locked up away from the road. Never leave your bike or belongings unattended. If you need to head off for food or the shops and cannot leave someone looking after your bike put it one of the nearby car parks. A few pounds are a small price to pay for peace of mind. These three are open and staffed 24/7. Liverpool Waters - Princes Dock - along from the Crown Plaza Hotel. The passenger terminal is on the floating stage, and marshalling area for bikes/cars has no facilities apart from the check-in booth. There is normally a burger van there during the TT. Toilets are in the passenger terminal on the floating stage, or in the hotels over the road - Crown Plaza or Mercure Atlantic Tower. Once on board the Manannan the deck crew will secure your bike to the railings on the deck, this is done by rope over the bike and around the foot peg, they'll put some cloth under the rope to protect your paintwork but if you want more protection take a bit of foam. McDonalds* is on the Strand and is 24/7, but if you are here during the day, consider heading to the Baltic Triangle area. Thursday to Sunday I recommend the Baltic Market at Cains Brewery on Stanhope Street. A good place during the day is Brasco Lounge near to Liverpool Museum on the waterfront, just a few minutes’ walk from the terminal. If you want something more substantial head to Liverpool One or Castle Street. * warning - a few bikes have been stolen in the past from McDonalds - don’t leave your bike unattended there! 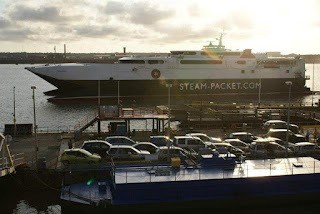 The cruise terminal is next to the Isle of Man terminal, and the ships berth on the same floating stage. Take care when cruise ships are in port, passengers are mostly American or continental European, who won’t be used to hundreds of bikes going past on the “wrong” side of the road. 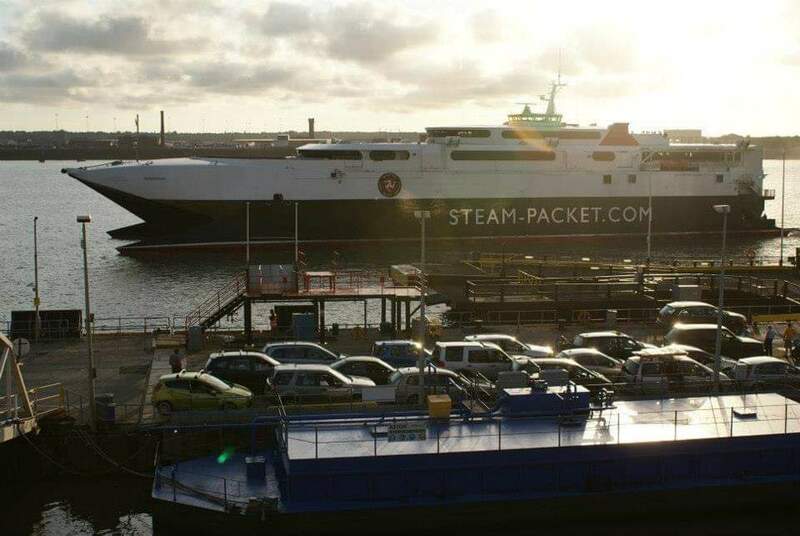 The larger ships can carry over 3,000 passengers and we can have up to 40 coaches heading to the terminal from shore excursions, plus hundreds of passengers walking back into the terminal especially in the late afternoon when our busy time is between 3pm and 6pm. 31st May to 2nd June – Bordeaux Wine Festival – no road closures for this but the site is adjacent to the ferry terminal – so it will be busy with pedestrians. When disembarking from Manannan on the way home you’ll leave the stage via the shorter of the bridges, this can be VERY steep at low tide (1 in 4), so take care. When you get to the top and into St Nicholas Place lots of bikes will pull over to group together, so it can get very congested here, especially with taxis and cruise ship traffic, if you are going to wait to group up, try riding around the back of the cruise terminal where there is much more space on Princes Parade. From St Nicholas Place you’ll come to the first set of traffic lights. For the M62 or Wallasey Tunnel and M53. Turn left then get into the middle or right lane to head up Leeds Street then follow the signs to the motorway or tunnel. For the M57 or M58, turn left and head north for 4 miles until you get to Seaforth and then follow the signs for the motorways. I hope the information above has been useful. If you spot anything that needs correcting, amending or adding to, please leave a comment and I'll get it updated. Since submitting my nomination to stand for Liverpool City Council in the Clubmoor ward the only response I’ve heard from the Labour side is that they are “hoping to see Labour wiping the floor with the LibDem candidate” – obviously Jeremy Corbyn’s call for a “kinder politics” is lost on Labour in Liverpool. I’m told that Clubmoor is a safe Labour ward and that nobody else stands a chance. But is that true? Well the raw figures point that way. At the last election the Labour candidate won in Clubmoor with 83% of the vote. However as with all statistics that doesn’t paint a true picture. With turnout of 23% that means only 19% of the Clubmoor electorate voted Labour. Just 4% voted for the other parties and 77% didn’t vote at all. Labour may be complacent about winning the ward, but I think having over three quarters of the local community not voting is a sad reflection of the way the people of North Liverpool are simply taken for granted by the Labour Party. Well this is your opportunity to look at your area and your city and ask yourself “is this good enough?” I certainly don’t think the way the current Labour council is running this city is good enough. I hope you read our manifesto and see that we have a strong plan for running the great city of Liverpool a better way. Building a sustainable future for the whole community. Demand Better. Vote for Liverpool Liberal Democrats. This year's local elections will be a new experience as I'll have my name on the ballot paper having been nominated to stand for the Liberal Democrats in the Clubmoor ward in Liverpool. I'm definitely not going into these elections with dreams of a landslide victory, Clubmoor is a solid Labour stronghold, but with the local party having ditched a long serving councillor and chosen a new candidate at least I'm not going up against an incumbent. I also won't be producing any paper leaflets, you get enough rubbish put through your doors without me adding to it. Why the LibDems? Well having been a member of the Labour Party for a quarter of a century, I thought the long dark days of Militant, and making promises we couldn't keep, were behind us. Whilst the Thatcher government deserves much of the blame for the near death of Liverpool in the 1980s, the then local Labour Party was another side of the same coin, driving business and a generation of people away from the city. Pragmatism and the building of a business friendly approach saved Liverpool, making it one of the fastest growing cities in the country. However the decline of the 70s and 80s was so deep that the rebuilding of our city and its reputation still has a long way to go. I was a supporter of Joe Anderson and I approve of much of what he has done, but I couldn't sit back and watch the Momentum takeover of the local party put at risk what has been achieved by both the LibDems and Labour Councils over the last 30 years. Having left the Labour Party I looked around at another party that best met by political instincts and found that home with the LibDems. Especially with their pro-European identity. Now I'm certainly not blind to the damage done to the party during the coalition government, indeed I lost my job in the civil service less than one year into that regime. But I'm can also see that they acted as a brake on the more extreme aspects of the Tories ideology, and what has happened since 2015 is testament to that. What about me then, raised in a one parent family, missed a lot of school time when my mum had a mental health illness, left school with no qualifications, but was determined to dig my way out of the hole I was in, and have worked in both the public and private sectors all of my working life. I was born and lived in Seaforth until my early 20s, moved south to work in London for a year, which turned into 20 years! before returning home 8 years ago. I'm also a strong believer in putting something back into the city and community so I spend most weekends volunteering in the tourism, culture and sporting sectors. My main focus if elected to the council would be jobs. Once you've got a job, paying a real wage, then everything else becomes easier. But getting investment into the city to create those jobs is only part of the solution. Issues around transport, childcare (and adult care), health care etc all impact on your ability to get and keep a job. I'd also want to hold developers to account for what they building, some of the recent new buildings are just plain shoddy, and simply not good enough for a city like ours. The number of failed projects which leave empty frames in the city and developers walking away with their pockets full of other's money is a scandal which must be stopped. Whilst there is no justification, or need, to building on our green spaces, we cannot afford to just leave them empty and unused. They must be seen as assets for the public good, safe spaces for children and adults alike to play in, socialise in and enjoy. Finally, I can promise you one thing - honesty. Whilst I've never run for, or held political office before, I have always been interested in politics, and something that infuriates me is when politicians refuse to give a simple answer to a question. That won't be me. So if you, like me, struggle to see what the Labour administration is actually achieving in the city, if you want a progressive alternative, if you want someone to represent you on the council and not the other way round, then please vote for me in Clubmoor. I'm writing this on Wednesday evening, 20th February, with the newly formed The Independent Group (TIG) standing at 11 MPs, so this may well have grown by the time you read it. From the outset I must declare my background, I supported the SDP in the Crosby By-Election in 1981, indeed I helped with leaflet printing and folding for that vote, however I later joined the Labour Party in the early 1990s, voted for Blair and Prescot to be Leader and Deputy, and was standing in Downing Street on a wonderful May morning in 1997 when Tony Blair arrived as our new PM. However I became increasingly disillusioned with Labour after 2010, see Corbyn as a totally unsuitable man to lead the party or be in government and left the party to join the Liberal Democrats a couple of years ago. I'm not an active member however, and I won't agree with the LibDems on all their policies but they are closer to my views on most things, especially on the disaster of Brexit. Another thing I have become disillusioned with is the tribal pantomime we see in the House of Commons, Prime Ministers Questions especially is grotesque, no questions are every truly answered and the atmosphere is toxic. I have always believed that the majority of people in this country are "small "c" conservatives with a social conscience". And with the move to the right and left by the two main parties, there is a huge voting space in the centre which has no-one speaking for it. Watching MPs on various political TV programmes it is infuriating that none of them seem to be able to answer a straight question, or they are blatantly economical with the truth. I really believe there is a vacancy in the centre ground crying out for leadership and something to vote for. I was therefore pleased to see 8 Labour MPs stand forward yesterday and even more so to see 3 Conservatives join them today. There will be many areas which these 11 people disagree on, but importantly many more where they can find common ground, and Brexit is uppermost in that list. Commentators have been eager to find out what TIG stands for, what are its policies, but this is only day 2 and so it is understandable that these details are not yet in place. I am thinking however of why are they being pushed into building a similar model to the frankly rotten system we have now? Why aren't we thinking wider, thinking outside the box. What is wrong with not actually having a formal party? How about having a vibrant, diverse coalition of independent, local MPs, elected to represent their own constituencies first and foremost, but who can cooperate on the big issues of the day to form a cohesive governing executive? There would be no whipping system on the government benches, and the government would have to find consensus within TIG to get legislation passed. Would that be such a bind, actually having to put effort in to persuade, not threaten, MPs to vote through any Bill. These are early days, and with politics in upheaval it is anyone's guess what happens next, but with Brexit looming over us we do not have the luxury of time. It's a quote that Brexiters are fond of repeating. That most GDP growth is outside of the EU. And of course they are right, some countries are growing faster that EU members, but as with all statistics the devil is in the detail. If Ethiopia became part of the EU, it would be the largest member state, both physically (4 times the size of the UK) and by population (102m). It would also be the poorest. Its per capita GDP is less than 3% that of Ireland's. So who should we trade with, Ethiopia or Ireland? The answer is of course both. But do we? China is of course Ethiopia's largest trading partner, as they are leading foreign investment into the country. But if we look at the top 20 exporters into Ethiopia we see 7 EU members - Italy, Sweden, Germany, France, Belgium, the UK and the Netherlands in that order. EU membership obviously doesn't stop us trading with Ethiopia, nor does it stop Italy doing so by 3 times as much as we do. And of course the EU and Ethiopia trade under the auspices of an EBA (Everything But Arms) agreement which gives Ethiopia duty and quota free access to European markets. By contrast our exports to Ireland (£34bn) are massive compared to Ethiopia (£200m). Indeed Ireland imports 10 times as much from the UK than Ethiopia does from the entire world. So while there is plenty of opportunity to increase trade with the latter, only a fool would risk our trade with the former in order to do so. Unfortunately in the shape of Rees-Mogg, Johnson, Fox, Farage etc one thing we are not short of is fools. 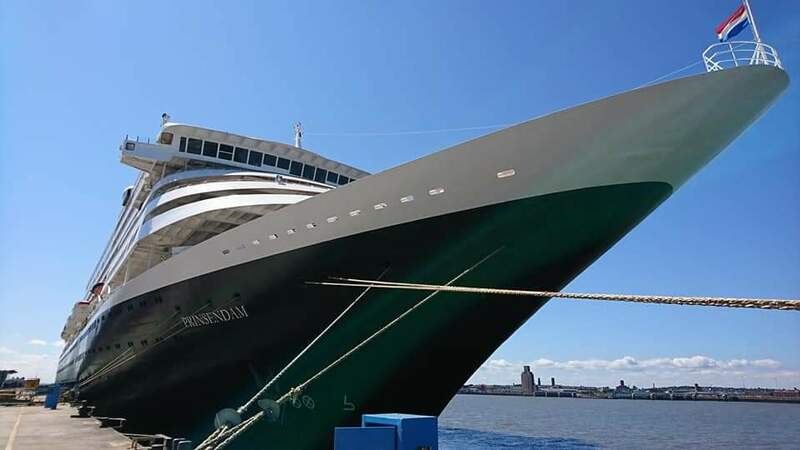 Another busy year has come to an end at Liverpool Cruise Terminal, which saw 57 ships calling during the season, bringing over 100,000 passengers and crew to the city. 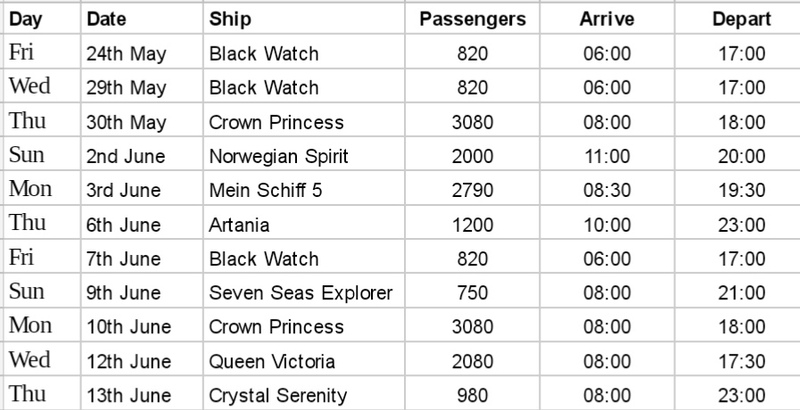 Included in this year's schedule were five ships - AidaAura, Berlin, Ocean Dream, Seabourn Ovation and Viking Sun - sailing into the Mersey for the first time. From sail to one of the most modern, and largest, ships in the cruising fleet, Princess Cruises, "Royal Princess" on the first of her four visits in 2018. "Prinsendam" arrived on 8th July on what will be her final call under the Holland America Cruises flag, she has now been sold to Phoenix Reisen, although I'm sure she'll return in her new colours as "Amera" since Phoenix are regular visitors. Princess Cruises "Royal Princess" was back on the Mersey on 28th July, at the same time as the returning Clipper Round the World Yacht Race. Swinging a 142,000 tonne, 330m long ship in the fast flowing Mersey amid a yacht race is just one of the challenges faced by our highly skilled river pilots, and of course successfully completed without so much as a ripple on the coffee cups of her breakfasting passengers. One of our maiden callers to Liverpool in 2018 was Viking Ocean Cruises "Viking Sun"
An unusual visitor on 16th October was "Ocean Dream". She operates for the Japanese organisation Peace Boat, a non-profit organisation which works to promote peace, human rights, equal and sustainable development and respect for the environment. 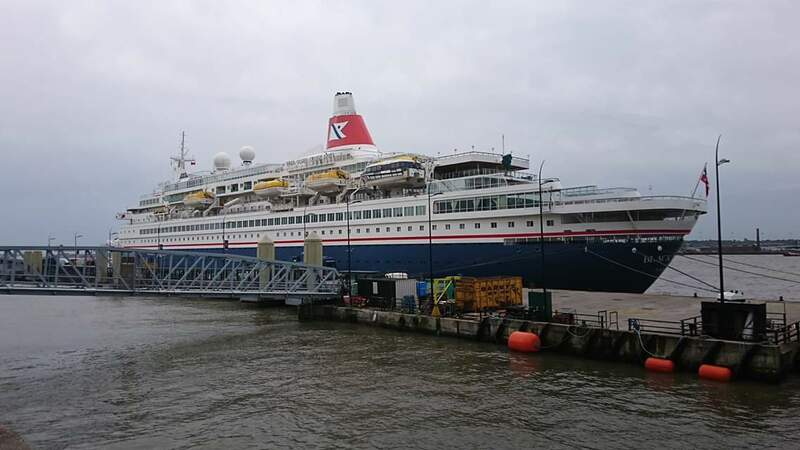 The 2018 season closed on 10th November with the departure of Fred Olsen Cruise Lines "Black Watch". She not only opened the season back in April, but was our most frequent visitor with 17 calls during the year. I hope you've enjoyed this brief look at the some of the ships that graced the Mersey this year. 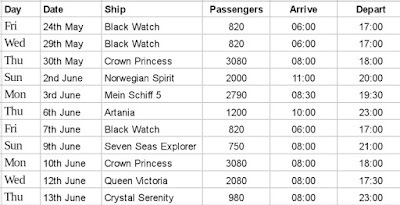 2019 is expected to be the busiest year yet for the Cruise Terminal, with 82 ships scheduled including 12 maiden calls including Costa Mediterranea, Celebrity Reflection, Viking Jupiter, AidaBella, Norwegian Spirit, Spirit of Discovery and Mein Schiff 5. Plus construction work will begin on the new terminal and hotel. Busy, busy, busy! One word can sum up this year's PokerStars Rally - WET! Thankfully the Irish Sea gods were kind to me as the 02:15 sailing on the Ben My Chree from Heysham on Thursday morning was quite comfortable, although I think I'm getting too old for these through the night sailings, I was shattered for the entire day afterwards. Anyway, down to the Grandstand on Thursday evening to pick up my Manx radio kit and document pack, by this time the forecast rain had arrived and heading back north over the mountain was a tad wild, I would have said horrendous, but that adjective will be needed for another paragraph. I already knew that I was rostered to do start line radio for Stages 1 & 4 on Friday night, and for three runs of Orrisdale, Stages 9, 12 & 15 on Saturday. But my plans to go and watch the Friday lunchtime Shakedown were scuppered as I was needed for Stop line radio duty on that too. A familiar Stop line position behind the Creg Ny Baa pub with a view over Douglas Bay, and it was clear to see why the morning ferry had been cancelled, it also allowed me to see the rain clouds rapidly approaching. Nothing really to note, everyone who had signed up for Shakedown got their laps in, and no dramas, those who left it late had some very wet roads to contend with, good practice for later in the day. A few mechanics, friends and family turned out to watch and get feedback from the drivers and I had a quick chat with Jason Pritchard, who was having a weekend out of the driving seat as his dad was piloting the NRG sponsored Focus WRC for this event. With the weather forecast looking foul for the evening, it was off to the Druidale Road above Ballaugh for the opening stage. Its a great position for the Start Line with a spacious gravel bed to accommodate everyone who needs to be there. I've done mid point and Finish on this stage before but not Start, so as it turned out I was the only radio car to see the entire entry list roll up. I was asked by the Clerk of the Course, via Bill Wilmer in Radio Control to issue an official instruction concerning standing water on the lower end of the stage, and knowing that bit of road I knew it would be flooding. The gravel bed where we parked was rapidly turning into a flowing river too. I can now use the term horrendous, and it was, our timekeepers were having a miserable evening as they were battered by torrential rain and gale force wind at our exposed spot at Druidale so it was with some relief that they greeted the news that the 3 evening stages would only be run once, as the second run through to form Stages 4, 5 & 6 had been wisely cancelled. As the back markers headed into the darkness it was time for our recovery team to get to work extracting a sizable number of stricken cars from ditches and verges. I stayed at the Start until my sister who was on Post 4 made it safely back down the stage and we headed home in convoy to Ramsey. I've never seen the main TT course so flooded, areas of it were completely under water, indeed the corner at Ginger Hall had become a flowing ford. Waking up to blue skies the next morning was a welcome sight, although the debris in the garden and on the roads was evidence of the wild night the island had slept through. Most of the flooding had receded as I made my way towards Kirkmichael and the Start Line of the 3 runs of the Orrisdale stage. Two handy driveways either side of the Start gave good accommodation to myself and the Rescue and Recovery vehicles, this stage was being run by the experienced Buccaneer Motor Club team, and my good friends Karen Spencer and Jon Binns were out in stage replacing stage signage that had succumbed to the overnight storm, but they were back in position ready for Stage 9 to begin and I was asked by Bill to remind them that we were running on 30 second starts, an instruction which was to prove aspirational at times. Listening to the radio traffic on the other stages, I heard the unwelcome call to "stop the stage" from Stage 8 (Dog Mills) as the rescue team headed off to an incident. Cars that hadn't started that stage were redirected straight to us at, although with the inevitable delay in getting cars to us using alternative instructions we had a 13 minute gap without any cars, this gap has to be monitored as if it goes past the 20 minute mark, then safety cars have to be put back through the stage before competitors are allowed their run through. However we got all the remaining cars through and away to their first service break. With the emergency services still dealing with the aftermath of the incident on Stage 8, it was decided that the second running of that stage (SS11) would be cancelled, so once cars had tackled Stage 10 (The Lhen) they would be coming straight to us Orrisdale, now running as Stage 12. By now the rain had also returned, although thankfully without the gales this time. Stage 10 duly recorded the only "same number out as they put in" of the entire event, and apart from a couple of mechanical retirements our stage also ran smoothly. Competing cars then headed to Jurby for their second service interval, and we tucked into our lunch bags kindly provided by Manx Auto Sport. So with service completed it was time for the final set of stages of this year's PokerStars Rally, The Lhen now running as Stage 13, and Orrisdale as Stage 15 (Dog Mills was still out of action so Stage 14 was unfortunately cancelled). We hadn't been running for long when I heard another unwelcome "stop" call from Stage 13, with the accompanying dispatch of the rescue cavalry to assist. Remaining cars were instructed to bypass that stage and head to us. With a eye on the time, and wanting to ensure we didn't get a long gap in our stage, we lengthened the start interval to 2 minutes, then 3, then 5 as we desperately looked to our arrivals area for sight of the diverted cars. We had just one driver awaiting his final start of the day when suddenly the lane started to fill up with the welcome sight and sound of rally prepped cars. At last we could go back to 30 second starts. The Buccaneer team ran the timing post, like, well like clockwork, as my control sheet filled up rapidly. The next half hour flew by until there in front of me was the Saab, number 104, the sweeper. And that was that, goodbye hugs all round on the start line, and it was my turn to head to Jurby to return my borrowed equipment. Alas the champagne had been sprayed and applause duly given by the time I got there, so I headed home for tea. With the 8am ferry to Birkenhead beckoning, it was an early wake up and a still dark drive over the mountain to Douglas. The wild weather hadn't quite finished with me though, as I got to the Verandah the fog descended, then rain started as I cleared the Bungalow, by the time I got to Kepple Gate I was driving through hailstone, this persisted until Hillberry when it turned back to rain. I was pleased to see a relatively calm sea though as I joined to queue to check in at the sea terminal and was soon back onboard the Ben My Chree and sailing away from the island for the last time this year. As we reached Liverpool Bay, the clouds cleared and we had welcome sunshine for the rest of the crossing and our arrival into a busy River Mersey.